What makes you, uniquely you? I love that question. Just stop and think about it for a minute. Is it your quirky personality? Are your eyes two different colors? Do you have a name no one has ever heard of? Do you have a sense of style that is uniquely yours? When ModCloth asked me to participate in this week’s Uniquely You campaign, I gladly accepted. One, because I adore ModCloth and their vintage clothes, accessories, shoes and such. Two, I love the idea of all of us just being uniquely us. No one else. Just who we were wired to be. What dress did they ask me to style? The gorgeous Bright Over Here dress, which is full of color! Here’s the ensemble I created via Wanelo. The look features the gorgeous dress of course, a cardigan in case it gets chilly, yellow wedges, a yellow necklace to tie it together, a white clutch to hold a few essentials and a beautiful headband perfect for a wedding. When I saw the Bright Over Here Dress I instantly thought of an outdoor wedding, and how this dress would be perfect for such an occasion. 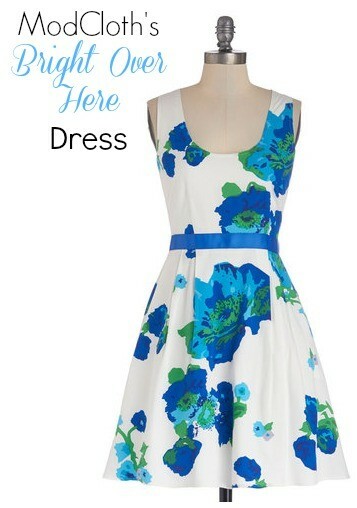 ModCloth has a ton of other dresses I would gladly wear to a wedding. So many choices!